Zigzag - 04/05 2019 » Download PDF magazines - Magazines Commumity! Zigzag is one of South Africa's oldest niche titles, and the fifth longest running surf magazine in the world. For more than three decades we've been delivering surf journalism of the highest quality, stunning surf imagery and world class magazine production values. 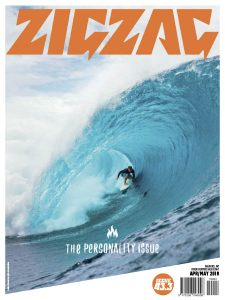 The Zag is aimed at anyone who surfs, from from fresh faced grom to grey haired grinder.